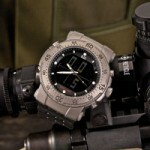 Once again, innovation is the “watch” word for 5.11 Tactical. When the company set out to design a titanium watch, it wanted one that would truly serve the needs of law enforcement. The H.R.T. Titanium Watch has all the features needed for day-to-day activities and includes the revolutionary SureShot calculator. In a partnership with Horus Vision, the H.R.T. also gives you the ability to input 13 critical variables needed for long-range shooting solutions out to 1,000 meters. Also, the luminescent markings can be charged with direct light to give you secure analog reading in the dark. MSRP $289.